Activists drove by the president's Mar-a-Lago resort in Florida, waving Puerto Rican flags and blasting reggaeton and salsa. WEST PALM BEACH, Fla. — Dozens of vehicles slowly approached President Donald Trump's Mar-a-Lago resort in Florida on Saturday afternoon, blasting reggaeton and salsa as they drove by. They honked their horns and waved Puerto Rican flags draped from their car windows and trunks. They were on their way to a rally a few miles away to mark the one-year anniversary of Hurricane Maria. Despite the scorching hot sun, hundreds of activists showed up at the Meyer Amphitheater in West Palm Beach. Buses full of protesters came from as far as Miami and Orlando. The crowd was lively. People spread out on the grass and walked around carrying posters that read "Respeta Mi Gente" (Respect My People) and "Justice for Puerto Rico." To one side of the stage, a giant blowup balloon of Trump depicted as a baby had been inflated. Crowds waited in line to take photographs in which they gave the orange balloon the middle finger. Event organizers encouraged those in attendance to vote in the midterm elections in November. Anyone with a microphone was constantly telling people to vote, to register to vote, and to spread awareness about voting. "We're honoring the lives that were lost," said Marcos Vilar, the president and executive director of Alianza for Progress, one of the event organizers. "We are recognizing all the people that were displaced and are living here in South Florida, central Florida and throughout the state." Vilar believes that although Puerto Ricans are citizens, the current administration's response to the aftermath of Hurricane Maria has proven that Puerto Ricans are not treated equally. Nearly 3,000 people have died as a result of Hurricane Maria, according to a study conducted by the Milken Institute School of Public Health at George Washington University. The president has repeatedly rebuked the death toll. Last week he tweeted that researchers had inflated the numbers "like magic," saying the amount was "FIFTY TIMES LAST ORIGINAL NUMBER -NO WAY!" Trump was not at Mar-a-Lago during the event. Florida Democratic Sen. Bill Nelson, who was in attendance, called the current situation in Puerto Rico "inexcusable" and characterized Trump's comments as offensive. "How much more insults do (Puerto Ricans) have to take after being treated like they have?" he asked. He also criticized the Federal Emergency Management Agency's relief efforts, saying their treatment of Puerto Ricans has been "cold-hearted" and that the agency must do more to provide displaced people with temporary housing assistance. Nelson is locked in a tight re-election race with Republican Gov. Rick Scott, who must leave office because of term limits. 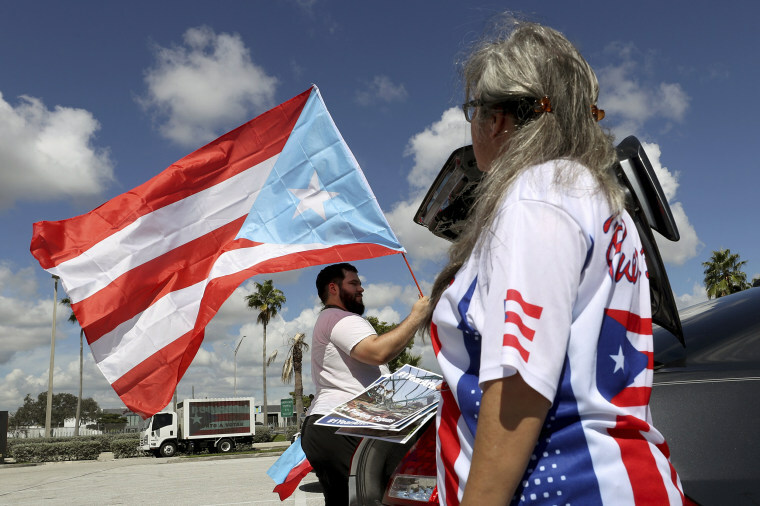 The large Puerto Rican vote in Florida is seen as a crucial bloc in the state. Scott has visited Puerto Rico numerous times since the hurricane. Dayavet Velez, 17, said her home in Adjuntas, a small municipality tucked away in the mountains of central Puerto Rico, had been destroyed by Hurricane Maria. She and her family have been living in central Florida for nearly a year. "We came here because we lost everything there," she said. Velez said that when Trump visited Puerto Rico, he didn't see the full devastation that Maria had caused, he saw only a distorted reality. He didn't visit the areas that were most affected by the storm. Despite the hardships she and her family have faced, the high school senior remains hopeful. "We're not going to be torn down," she said. "We're going to stand up for ourselves ... we're going to be strong ... we're going to progress here."